Mr. Sherman was always a sound man, sane in his views of life, hopeful, helpful, industrious, frugal, interested in all civic and political issues and activities as well as intelligent in the discharge of them. In short, he was of the kind of men who have made our nation what it is, and may the stamp which they have left on our institutions and our lives, never be effaced." 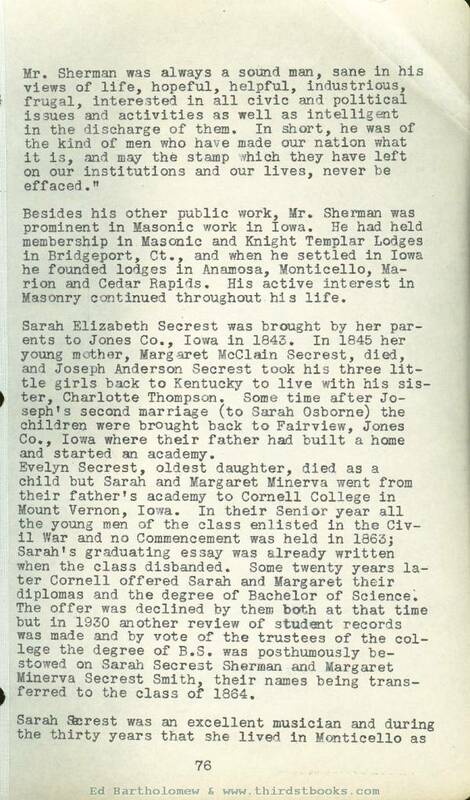 Besides his other public work, Mr. Sherman was prominent in Masonic work in Iowa. He had held membership in Masonic and Knight Templar Lodges in Bridgeport, Ct., and when he settled in Iowa he founded lodges in Anamosa, Monticello, Marion and Cedar Rapids. His active interest in Masonry continued throughout his life. Sarah Elizabeth Secrest was brought by her parents to Jones Co., Iowa in 1843. In 1845 her young mother, Margaret McClain Secrest, died, and Joseph Anderson Secrest took his three little girls back to Kentucky to live with his sister, Charlotte Thompson. Some time after Joseph's second marriage (to Sarah Osborne) the children were brought back to Fairview, Jones Co., Iowa where their father had built a home and started an academy. Evelyn Secrest, oldest daughter, died as a child but Sarah and Margaret Minerva went from their father's academy to Cornell College in Mount Vernon, Iowa. In their Senior year all the young men of the class enlisted in the Civil War and no Commencement was held in 1863; Sarah's graduating essay was already written when the class disbanded. Some twenty years later Cornell offered Sarah and Margaret their diplomas and the degree of Bachelor of science. The offer was declined by them both at that time but in 1930 another review of student records was made and by vote of the trustees of the college the degree of B.S. was posthumously bestowed on Sarah Secrest Sherman and Margaret Minerva Secrest Smith, their names being transferred to the class of 1864.
the wife of Henry David Sherman she was active in all cultural and civic work. Afte the family's removal to Cedar Rapids in 1893 she became a leader in the work of the Woman's Club of which organization she was treasurer and historian for many years. William Secrest, b. Sept. 15, 1755, in Virginia; d. in July, 1825; m. Anne Ingraham (or Ingram) b. Sept. 21, 1760, in Virginia.
. William Secrest migrated early to Kentucky, probably about 1790. 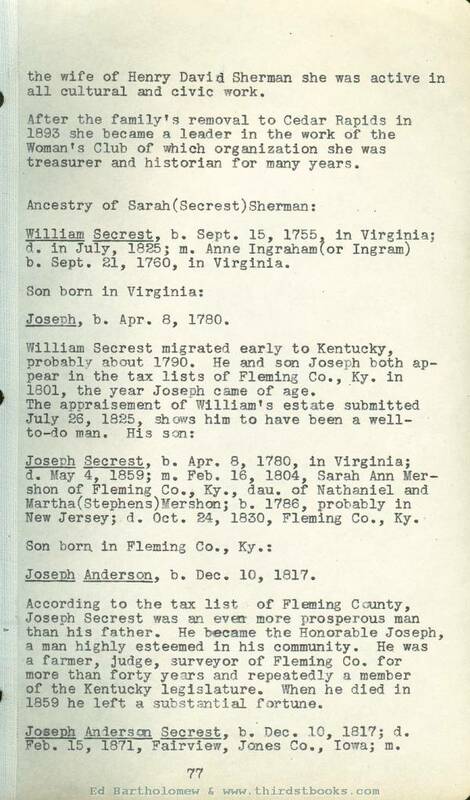 He and son Joseph both appear in the tax lists of Fleming Co., Ky. in 1801, the year Joseph came of age. Joseph Secrest, b. Apr. 8, 1780, in Virginia; d. May 4, 1859; m. Feb. 16, 1804, Sarah Ann Mershon of Fleming Co., Ky., dau. of Nathaniel and Martha (Stephens) Mershon; b. 1786, probably in New Jersey; d. Oct. 24, 1830, Fleming Co., Ky.
Joseph Anderson, b. Dec. 10, 1817. According to the tax list of Fleming County, Joseph Secrest was an even more prosperous man than his father. He became the Honorable Joseph, a man highly esteemed in his community. He was a farmer, judge, surveyor of Fleming Co. for more than forty years and repeatedly a member of the Kentucky legislature. When he died in 1859 he left a substantial fortune. Joseph Anderson Secrest , b. Dec. 10, 1817; d. Feb. 15, 1871, Fair view, Jones Co., Iowa; m.
Aug. 8, 1839, in Putnam Co., Indiana, Margaret Taylor MacClain, dau. of David and Elizabeth (Stout) MacClain, b. Aug. 7, 1821, in Shelby Co., Ky.; d. Mch. 12, 1845, Anamosa, Jones Co., Iowa. Joseph Anderson Secrest, was sent to Indiana as a youth, where he received a liberal English education. He went to Putnam County to teach where he met and married Margaret Taylor MacClain whose family had moved to Indiana from Shelby County, Ky. In 1845, Joseph Anderson and his young "wife migrated to Jones County, Iowa where his uncle, Cornelius Merton, had moved and settled. He established at Fairview, Jones Co. an "academy for the higher education of young people" in which he taught until his death in 1871. Sarah Elizabeth, dau. of Joseph Anderson and Margaret (MacClain) Secrest, married Henry David Sherman. Henri Ie Marchand, a Huguenot refugee from Normandy, France, came to Maidenhead, near Lawrenceville, N. J. about 1685 bringing "with him his only son, also named Henri. He later returned to France leaving the son in America, Son Henri anglisized his name to Henry Mershon. He married Ann, Mentioned in his will dated July 19, 1738. Nathaniel, mentioned in his father’s will; married Martha Stephens, dau. of Benjamin Stephens; this marriage is in a list of early marriages on file in Trenton, N.J. Martha died in 1796 in Mason Co., Ky. Nathaniel died Mch. 4, 1813 in Fleming Co., Ky.
Sarah Ann (called Sally) m. Hon. Joseph Secrest. 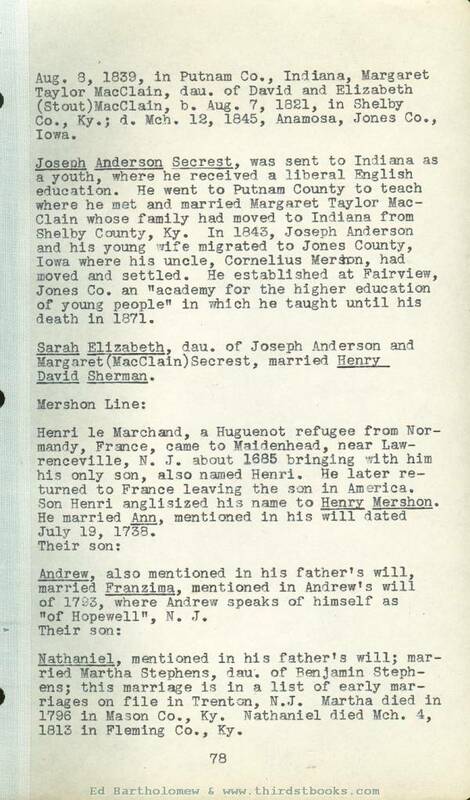 It is not known just when Nathaniel Mershon migrated from New Jersey to Kentucky but probably about 1790, as he appears on the tax lists of Mason Co., Ky. in 1791. He continues to appear there until 1797 when Fleming Co. was separated from Mason. From 1798 until his death he appears on the lists of Fleming Co.
Nathaniel Mershon was an American soldier in the Revolutionary War; his record is on file in Trenton, N.J. According to English's "Conquest of the Northwest", vol. 2, p. 847, Nathaniel Mershorn was allotted 108 acres of land in "Clark’s Grant (Indiana) for services as a private under Gen. Rogers Clark". XV. (9) ALBERTINE SHERMAN, dau. of Henry David and Sarah Jane (Tompkins) Sherman, born Sept. 18, 1855, at Bridgeport, Ct.; married Nov. 18, 1878, at Cresco, Iowa, James C. Drake, son of John Fowler and Pamella (Curtis) Drake, born Sept. 2, 1850, at Cochocton, N. Y.; died July 14, 1923, at Tacoma, Washington. i. Bertie Elizabeth Drake, b. Nov. 18, 1882.
ii. Alexander Mitchell Drake, b. Oct. 21, 1884; d. Aug. 5, 1886. 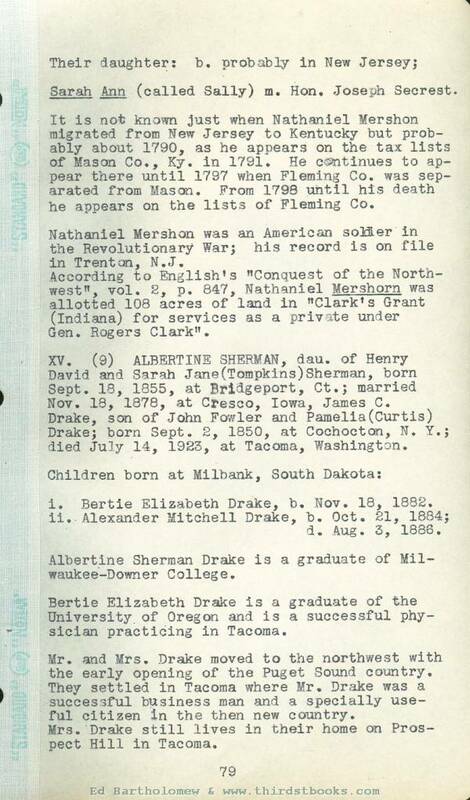 Albertine Sherman Drake is a graduate of Milwaukee-Downer College. Bertie Elizabeth Drake is a graduate of the University of Oregon and is a successful physician practicing in Tacoma. Mr. and Mrs. Drake moved to the northwest with the early opening of the Puget Sound country. They settled in Tacoma where Mr. Drake was a successful business man and a specially useful citizen in the then new country. Mrs. Drake still lives in their home on Prospect Hill in Tacoma. XV. 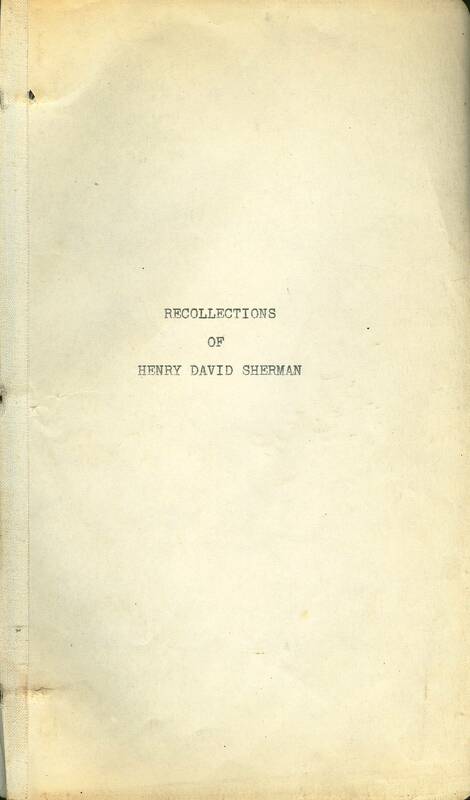 (9) ERNEST ANDERSON SHERMAN, son of Henry David and Sarah (Secrest) Sherman; born Apr. 6, 1868, at Monticello, Iowa; died Oct. 24, 1929,, at Minneapolis, Minn.; married, Apr. 20, 1892, at Des Moines, Iowa, Robertine Wheaton-Tone, dau. of Robert Albert and Betsy (Graves) Wheaton, born Feb. 16, 1869, at Norwalk, Ohio. i. Erwin Henry, b. Jan. 28, 1894, m. Elizabeth Agnew Bingham. ii. Robert Ernest, b. Mch. 31, 1895, m. Jessie Elberta Broadwell. iii. Sarah Ernesta, b. Sept. 18, 1901, d. Feb. 5, 1905. iv, Bessie Faith, b. June 27, 1906, m. William Joseph Routledge. He held the office of Commissioner of Public Safety in Cedar Rapids and lectured through the country on the Commission Plan of government for cities. In 1912 he and his family moved from Cedar Rapids to Minneapolis where he became "Executive Secretary for the Insurance Federation of Minnesota, which position he was holding at the time of his death. Mr. Sherman was a man held in high esteem by all who knew him and loved by his friends.